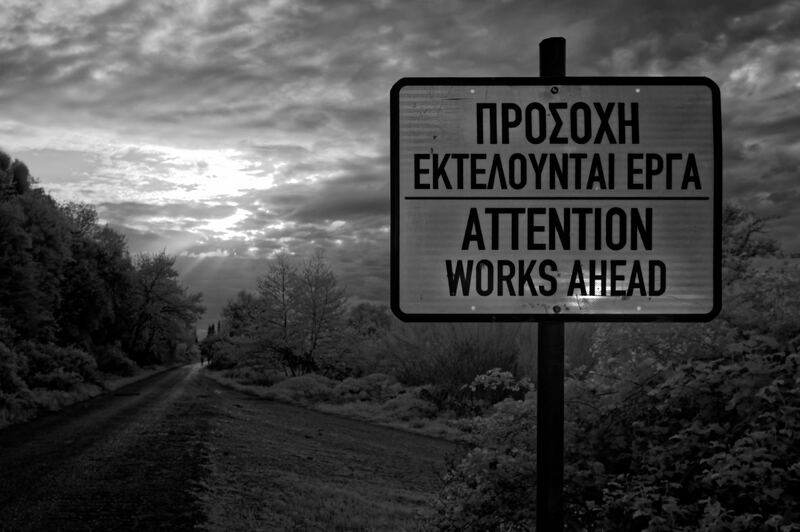 An infrared photo depicting a sign by the sign of the road, reading “Attention Works Ahead” both in Greek and in English. I should have presented this photo some time ago because it describes the current situation perfectly. I haven’t presented a photo for quite some time. It was due to upgrading my computer and moving to a new computer environment. I have always been a Mac user. For the past year or so I had to use Windows; an awful experience indeed. Finally I decided to upgrade my computer and move back to Mac OS X or Linux, if things didn’t work out. I also decided to move away from Adobe products, which meant that my whole photography workflow had to change as well. I like to have consistency in my work. Changing computer software meant that my photos would look different when the transition was done. So, I decided to refrain from posting for a while, as the transition was in progress. Now that it is finished I can focus again on presenting my photos in the Photoblog and various social media. Although the sign reads “Attention Works Ahead”, the hard work is actually behind. I still haven’t settled on what my photography workflow will be. I am awaiting the move from a certain company before I make any final decision. I took this photo near the village of Loutro (or Krikellos), near Amfilochia in western Greece. Shortly after this spot there are the construction works for the new motorway that runs across western Greece. The reason I made the photo is the clouds in the sky. It would be difficult to make a meaningful photo with just the clouds. This sign was a good object for the foreground and the road to the left adds another layer in the composition. Despite the plain subject, I like the final result!